Shopping is a common activity of people worldwide. It used to be that you would walk to your local market, or make the long trip to a city center for what you need. Nowadays, people just drive to the store every week or multiple times each week. There are certainly benefits to this new way of shopping: people can buy a wider range of items than ever before in human history. The downside of how we shop is that driving and parking create incredible headaches for consumers. This becomes a problem especially when the average consumer goes to the grocery store 1.5 times per week. Grocery chain Trader Joe's keeps costs down in their stores by using the minimum city-required number of parking spaces. This results in people being angry over parking at Trader Joe’s. But the problem isn’t Trader Joe’s or other grocery stores with limited parking, it’s that people are obligated to use their cars to go shopping. People are worried that online grocery shopping contributes to potential weight gains, but there are also problems with vehicle access to grocery stores. It’s been found that access to a vehicle directly correlates to healthy food access. So you either shop nearby for unhealthy food or need to drive and deal with stressful parking to eat healthily. Shouldn't there be a better option? 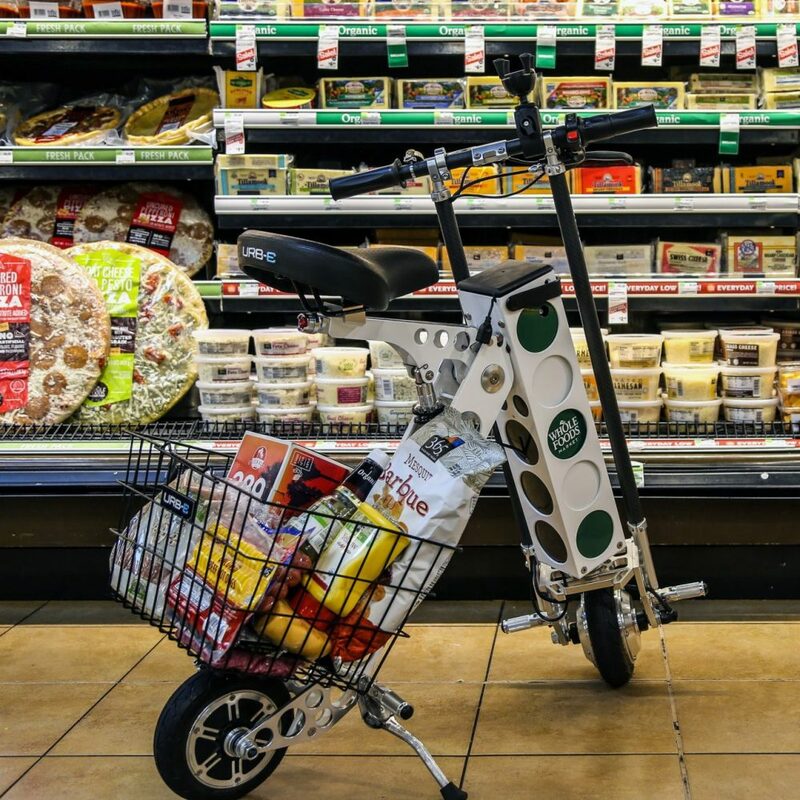 The URB-E urban electric scooter is the perfect solution to grocery access problems. 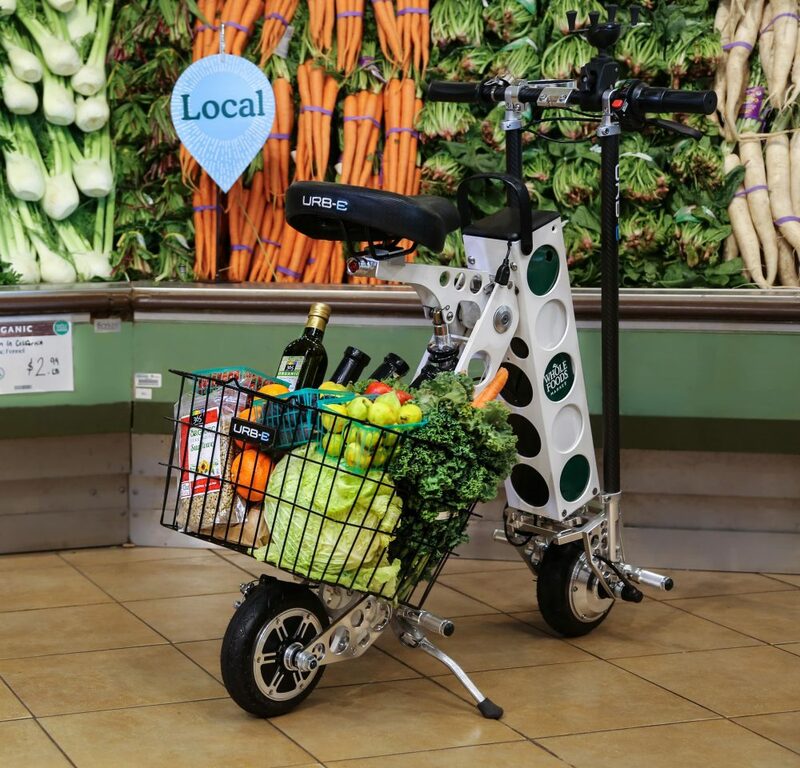 With an URB-E, you have a 20 mile range to get to and from the grocery store. By using the URB-E basket (included with the City Edition URB-E) you have everything you need to get to the store, carry your groceries, and ride back home. And with an URB-E, you can guarantee that everything in your grocery trip, from the tomatoes to the URB-E's aircraft-grade aluminum, is produced in America. Not only is the URB-E built in Pasadena, it also produces no emissions. With an URB-E, you can feel better about your shopping trip while having a lot more fun. You can learn more about the URB-E folding electric scooter by visiting our "About" page here: http://www.urb-e.com/about-urb-e-electric-scooter/. And you are always welcome to call us at 1(626)460-8113, email us at info@urban626.com, or visit our Pasadena headquarters!